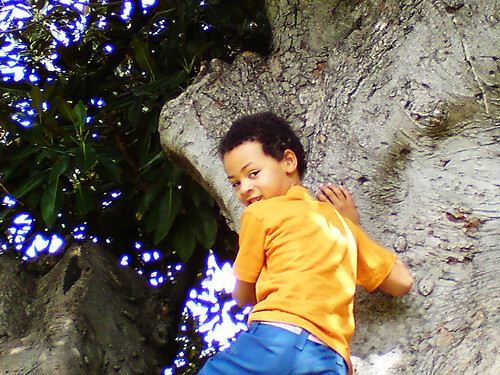 This is me up one of my favourite climbing trees. Mum’s always taking photos of me, and psst – don’t tell anyone, but I kind of like it. (Mum’s already used this one on her website so perhaps she’s just not taking enough photos of me). When mum took this we’d just been to see my cousin in the hospital and I tried to tease her but she was a bit too sick to be teased and mum told me to stop. She’s been in hospital for about two weeks now and mum said to say that so far all the tests she’s had done have come back clear. When I’m not climbing trees I’m usually running around doing something. I don’t sit too still for long, but when I do want a bit of quiet time I like playing with my stretchy plastic lizards or my fluffy penguin. I also love drawing and writing. I’ve written this little book about a hungry fish who’s pretty too. There’s a mean octopus and a nasty shark in it. Mum makes a big fuss over it and she gets me to read it to her every now and again. Now, my mum. I love her to bits and she’s my favourite person in the world, but I wish she wouldn’t yell at me sometimes. Last night she cooked a beef stirfry and she put capsicum in it. She knows I hate capsicum but she keeps putting it in food and making me eat some of it and then gets cross with me when I don’t. I carried on a lot last night and didn’t finish my dinner so I missed out on dessert. I like my dessert and I would have had an icecream last night but I didn’t. I apologised to her this morning about my carry on. I think she likes it when I apologise to her. Actually I think all adults like apologies when I’ve been naughty and I’ve been naughty a bit lately. Don’t know if mum’s mentioned it, but I’ve been in a bit of trouble at school and the teachers are keeping a close eye on me at the moment. Mum’s also been talking to the deputy principal a bit and she’s also taken me to someone who asks me lots of questions and expects me to talk a lot to her. The first time I saw her I just answered her back but I’m getting used to her now. She’s actually ok.
I’d better go now and next time you visit this website, mum might have written something. She’s been really busy with me which is why she’s not around here so much. I hope you have lots of fun and learn ways to not be distracted into naughtiness (because it is soo tempting too often my daughter tells me) so much and you can have more of those great moments when Mum isn’t yelling. Kristi, (JJ’s mum here) – sometimes I think my son’s apologies are knee jerk because he does them so often but then sometimes I can tell when they are heartfelt. Now to just get him thinking before he acts, that’s the tricky bit. I looked at that photograph and said, “I know that kid!“. Then I realised it’s been a LONG time since last I visited this blog. Hello JJ. You keep being the good little boy I had a long chat with from Adelaide to Aldinga, and life will be great for you! Thanks Stephentreneur (that’s a hard one to type). JJ’s watching Spongebob right now so it’s his mum here, but thanks for dropping by. Hopefully we’ll get to another Flickr meet soon. Hey JJ….don’t you look great climbing that tree? I know your mum takes lots of pictures of you, but I really love seeing them…and have loved seeing them since you were just a little guy. I love seeing how big you’ve gotten, and honestly, your mum takes GREAT pictures. I have to agree….she’s pretty wonderful alright. I know you know how lucky you are to have her….as mums go…..she’s the best! Yeah, I know you’ve been having some problems at school, and I hope those problems clear up and go away for you and your mum; but always remember to talk things over with your mum no matter what. There’s no one who will listen to what you have to say better than your mum. Keep up your drawing and writing JJ….we would love to see some of your work right here on your mum’s blog….or maybe even on YOUR OWN blog one day. “Joy, Thank you very much. I hope you have a good time doing whatever.” That’s from JJ. And from me – I’ve got JJ’s book sitting near me. I’ve been thinking of putting it on my website and shall get around to it. Thanks, as always Joy.